Egyptian Health Minister Hala Zayed announced on Friday that 14.28 million Egyptians have been screened as part of the “100 million healthy lives” presidential initiative against the Hepatitis C virus and other noncommunicable diseases. Zayed added that the initiative has achieved a new record in the number of respondents under the presidential initiative, which has surpassed half-million citizens examined daily since starting in December 2018. She pointed out that the number of examined citizens in governorates covered in the second phase of the initiative already exceeded 2.25 million. Zayed said that people some governorates continued screening beyond target rates for the seventh day of phase two until Thursday, such as in Ismailia, Aswan, the Red Sea, Beni Suef and Luxor. These governorates exceeded the target daily rates by up to 136 percent. In related news, a delegation from the World Bank on Thursday, visited the situation room for the initiative. This delegation included the World Bank Health Manager for Middle the East and North Africa Ernest Massiah, World Bank Representative in Egypt Amr al-Shalakany, and Maria Laura the Program Leader for Human Development for Egypt. During the visit, Massiah stressed that the World Bank is keen to cooperate with the Health Ministry in this initiative for the positive results achieved during the first phase, adding that he looks forward to transferring the Egyptian experience from this campaign to other African countries and the rest of the world. The screening campaign for Hepatitis C began earlier this year, targeting people aged 19 to 59 for scanning through PCR tests. Those testing positive for the disease are expected to undergo further check-ups, and will be provided free medication. 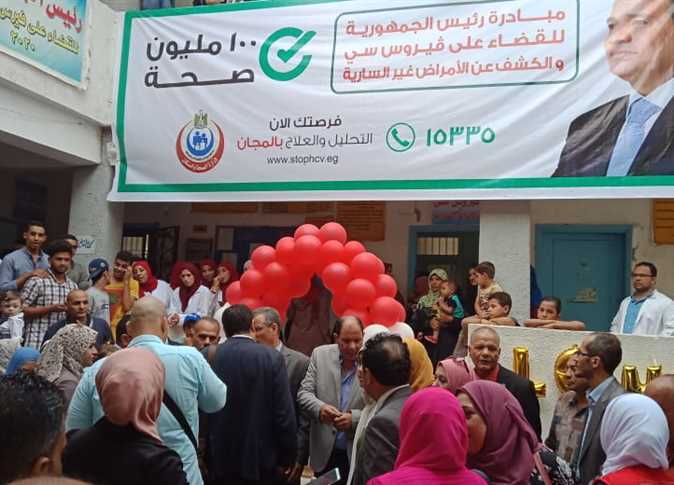 The “Tahya Masr” (Long Live Egypt) Fund announced in an August statement that the Hepatitis C virus in Egypt will be completely eradicated by 2020, through one of the largest medical examinations in human history. It added that 45 million people will be screened in collaboration with the United Nations World Health Organization (WHO) to prevent the disease, and tackle the country’s list of endemic diseases. Egypt has the highest rate of Hepatitis C in the world, first surfacing in the 1950s due to unsterilized injections. The highly-infectious blood borne virus kills an estimated 40,000 Egyptians a year, and at least 1 in 10 of the population aged 15-59 are infected, according to the WHO.